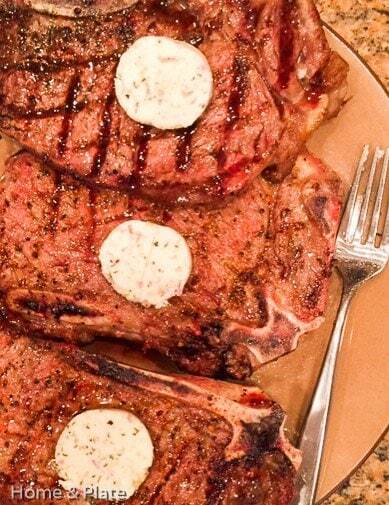 “Better than a steakhouse dinner!” – that was the general consensus after I served New York strip steaks grilled to perfection and topped with a compound butter made with garlic, shallots and fresh herbs. The steaks were fresh and seasoned before going on the grill. I have grilled steaks a million times before and it’s not rocket science when it comes to juicy, flavorful beef. The same goes for chicken and fish. 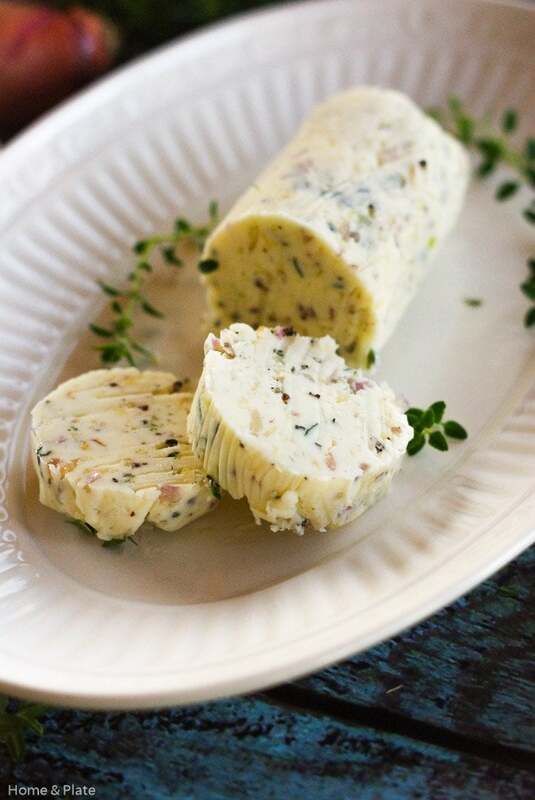 But add a disc of creamy herb-flavored compound butter and the results are something spectacular. 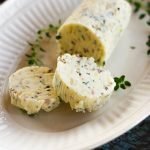 This recipe is simple to make and just requires butter at room temperature, some fresh herbs from the garden or grocery and parchment paper or plastic wrap. This is my standby topper for just about anything that can go on the grill. And this recipe can be adjusted for whatever flavors you prefer. Now the holidays are right around the corner and this is a perfect DIY foodie gift from the heart and kitchen. Just let your butter come to room temperature and get creative. 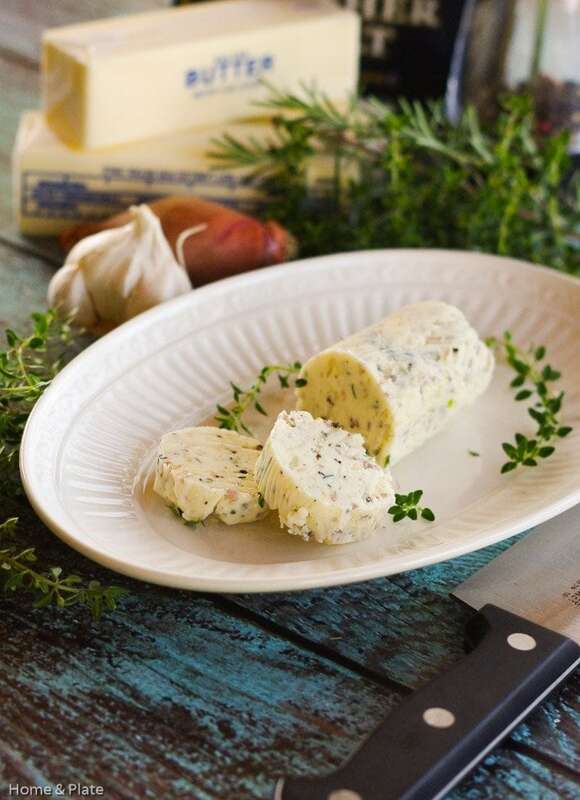 Wrap your butter in parchment paper, twist the ends and attach a ribbon …..and “Merry Christmas.” A gift of flavored compound butters makes a delicious and thoughtful hostess gift. Use one stick of butter and mix in whatever you want. Mustard, lemon zest, wine, Port, bacon, any kind of fresh herb. You can even make your compound butter sweet by adding sugar and honey or maple syrup and fresh fruit. Imagine how yummy that would taste on top of pancakes or waffles. The possibilities are endless. 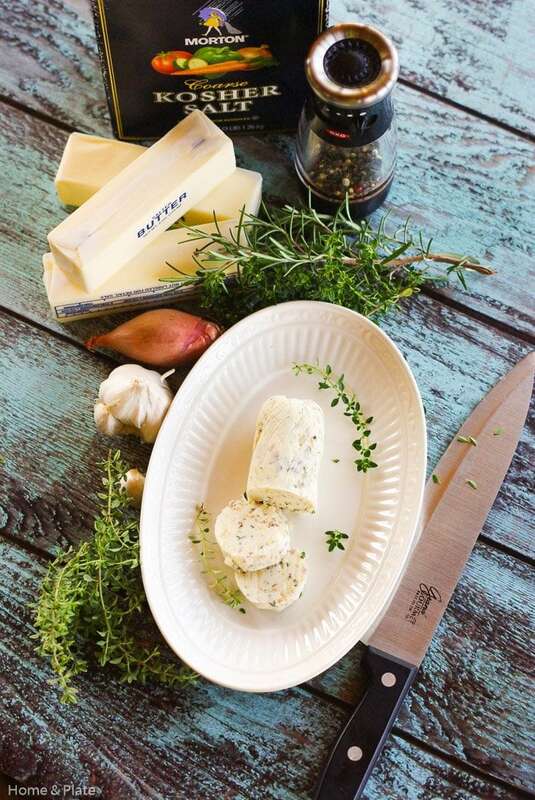 Compound Butter with Garlic, Shallots & Herbs makes the nicest homemade holiday gift for a neighbor or friend. Use it on steaks, chicken and fish! Add all the ingredients to a small bowl and mix well. Using a rubber spatula, scoop the mound of butter onto a piece of plastic wrap or parchment paper. Using one end of the wrap or paper, mold the wrap around the butter rolling and forming it into a log. Refrigerate the compound butter for 2 hours. Slice the butter into 1/4-inch thick round discs and add it to your steak, chicken or fish after it has finished cooking. Allow the butter to melt the serve. Thanks Carmella…it transforms the taste. Incredible! Makes a great gift. Homemade is from the heart and even the kids can participate in the kitchen with this one. Gorgeous!! This looks and sounds incredible and you’re right, this would make such a fabulous gift! Thanks Kimberly. Easy to make too. Perfect for any foodie. 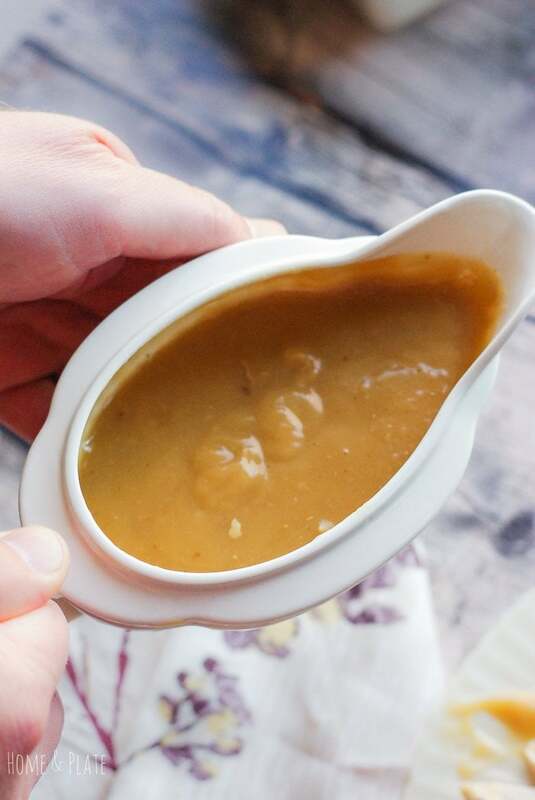 I love compound butters and this one is such an incredible combo of flavors. Thanks Marlynn. It sure changes the taste of anything you put it on. I had no idea it was so simple! This would definitely be a perfect gift! It would be and there are so many ways to change it up. Thanks Liz. I love compound butters. I use them year-round on everything from meats to veggies to breads. I would love to get this one for a holiday gift! They are so yummy. Any flavor would be delicious and they’re so versatile. Love compound butters, and yours looks fantastic. Great embellishment for perfectly grilled steak. And it tastes so good on anything off the grill. The possibilities in the butter are endless. Thanks Homa!